Stun the first enemy hit for 1 seconds. Verdant Spheres causes Gravity Lapse to stun the first 3 enemies hit and increases the stun duration by 50%. Launch a Phoenix to an area, dealing 171 damage to enemies along the way. The Phoenix persists for 7 seconds, attacking enemies for 171 damage and splashing for 50%. After 2 seconds, cast a slow-moving fireball that deals 2150 damage to an enemy Hero and 1075 damage to enemies nearby. 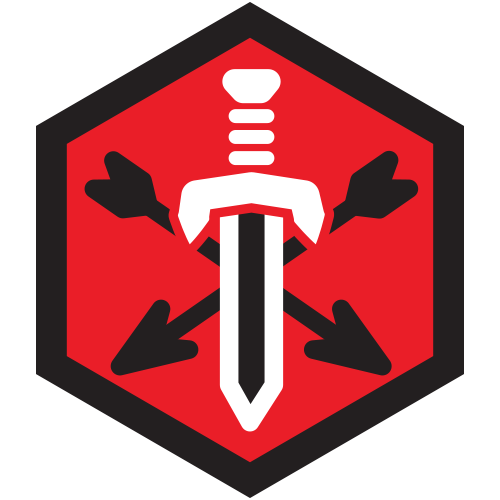 Quest: Damaging an enemy Hero with Flamestrike increases increases its damage by 5, up to 100. This bonus is lost on death. Reward: After hitting 20 enemy Heroes increase Flamestrike damage by an additional 100 and no longer lose any bonuses on death. Quest: Damaging an enemy Hero with Flamestrike increases increases its damage by 5, up to 100. This bonus is lost on death. Reward: After hitting 20 enemy Heroes increase Flamestrike damage by an additional 100 and no longer lose any bonuses on death. Increases Kael'thas's Spell Power by 4%. 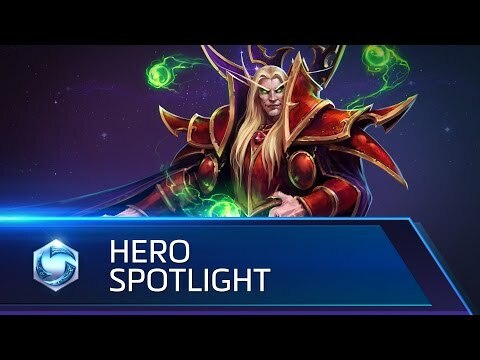 Kael'thas heals for 94 Health when activating Verdant Spheres. Quest: Gathering a Regeneration Globe increases Kael'thas's maximum Mana by 15. Reward: After gathering 20 Globes, Kael'thas can activate Arcane Barrier to gain a Shield equal to 100% of his maximum Mana for 4 seconds. 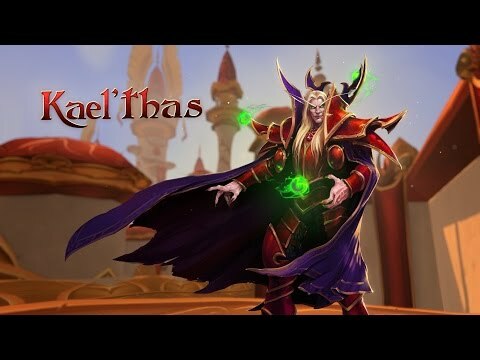 Quest: Gathering a Regeneration Globe increases Kael'thas's maximum Mana by 15. Reward: After gathering 20 Globes, Kael'thas can activate Arcane Barrier to gain a Shield equal to 100% of his maximum Mana for 4 seconds. Reduce the Mana cost of Gravity Lapse by 70. If Gravity Lapse hits a hero, reduce its cooldown by 9 seconds. Activating Verdante Spheres restores 3.9% of your maximum Mana. When Flamestrike damages 2 or more Heroes, they take additional damage to 8% of their maximum Health. Activating Verdant Spheres causes Kael'thas's next 2 Basic Attacks to instead deal 115 Spell Damage. If both of these Attacks hit enemy Heroes, gain 15% Spell Power for 10 seconds. Increases Phoenix duration by 100%. You may order the Phoenix to move to a different location once while the Phoenix is alive. Increase Pyroblast's explosion radius by 50%. 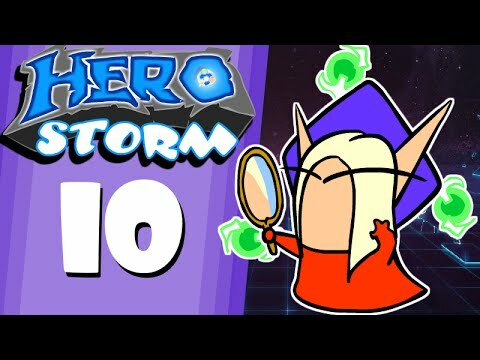 Heroes that are hit by Flamestrike or have Living Bomb spread to them reduce the cooldown of Pyroblast by 10 seconds. When Flamestrike damages an enemy Hero, increase its damage by 5, up to 100. Lose all damage bonuses if you die. When you gain 100 damage bonus, increase Flamestrike damage by an additional 100 and no longer lose the bonus if you die. Increases your Ability Power by 5%. Heal for 206 Health when you activate Verdant Spheres. Increases your maximum Mana by 15 when you pick up a Regeneration Globe. Once you've gathered 25 Regeneration Globes, you can also activate Arcane Barrier to gain a Shield equal to 100% of your maximum Mana for 4 seconds. 45 second cooldown. When Gravity Lapse hits a Hero, reduce its cooldown by 9 seconds. Gravity Lapse causes enemies to take 25% additional damage from Kael'thas for 4 seconds. Activating Verdant Spheres causes your next Basic Attack to instead shoot a spell dealing 362 (172 + 4% per level) damage. Each time Living Bomb deals periodic damage, your Basic Ability cooldowns are refreshed by 1 second. Increases Living Bomb's explosion radius and damage by 20%. Your Basic Attacks do 417 bonus damage to enemies affected by Living Bomb. Increases Pyroblast's explosion radius by 50% and reduces its cooldown by 25 seconds per enemy Hero hit.